After the tough time I had getting from Front Royal to Big Meadows, I had decided that the goal for today would be Loft Mountain campground, only about 30 miles from Big Meadows. I left Big Meadows around 8:00 AM, saying good-bye to the other 3 tourists on my way out of the campground. I was figuring that no matter how hot and muggy it became, I could make slow steady progress from one overlook to the next, and reach Loft Mountain with relative ease sometime in the afternoon. As it turned out, the road from Big Meadows to Loft Mountain contains much more downhill than up. Even with a delay due to mechanical problems, I was sitting at the Loft Mountain Wayside eating lunch at 11:30. After leaving Big Meadows, I enjoyed some downhill runs on the way to Swift Run Gap. 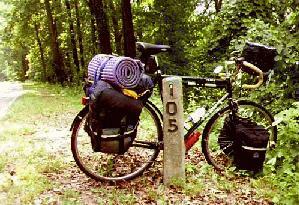 Just past this Gap, at the Swift Run overlook, I decided that my saddle was a bit too low. Dutifully, I dug my "Cool Tool" out of my seat bag, extracted the proper Allen wrench from it, and proceeded to loosen the seat-clamp bolt, adjust the seat height, and re-tighten the bolt. Just as I was snugging up the bolt, snap!. I had sheared the bolt off. Uh-oh! After spending a few moments thinking about what a dunce I was, and calling myself a series of names, I considered the problem. First, half of the bolt was still in the clamp, and I had nothing with which to grab it in order to turn it out. I thought if I could conquer this problem, one of the spare bolts I carried would fit and I would be back in business. Fortunately, I was rescued by a couple in a Winnebago with a well-stocked toolbox. Borrowing a pair of vice-grips, I managed to extract the remnants of the broken bolt. Thinking I was home-free, I emptied my little film can of spare parts and tried a couple of the bolts within. Nope. None of them fit. Contemplating riding the 20 or so miles to the nearest bike shop while standing, I decided to browse my meager stock of spares one more time. Hmmm. Maybe.... Yup. The spare bolt and nut I carried to mount the low-riders through the front forks just fit through the seat clamp. Whew! Back in business. Soon after, as I was climbing a hill, I was joined by a man on a mountain bike who caught up from behind. We spent a few minutes in conversation, and I learned that he and his wife were planning a cross-country tandem ride for the summer of '98. He soon dropped off to wait for his wife, who was climbing behind us. Just a few minutes later, the first two of the trio of tourists I had met the night before caught and passed me. As we were just going over the top of the hill, I latched onto the wheel of the second bicycle, and drafted him down to the store/restaurant at Loft Mountain Wayside. This was my goal for the day. Since it was only 11:30, I sat down to eat lunch and re-think my plans. I didn't want to stop so early, but if I pushed on the next campground was another 85 miles down the road. Definitely out of the question! I munched my peanut butter sandwich and stared at my maps, waiting for inspiration. Finally, I decided to continue on to the end of the Skyline Drive at Rockfish Gap, buy food and fill up my water bag at the convenience store at the Gap, then ride up the Blue Ridge Parkway for a few miles and find a place to guerrilla camp. While the Drive continued to be a series of ups and downs, the 'downs' prevailed in the afternoon. From Loft Mountain south, the road surface is not up to the same standards as the rest of the Drive. Also, the scenery is not nearly as nice. This part of the Skyline Drive seems to be just an 'access road' to get to the more interesting and scenic parts further north. Eventually, I reached milepost 105, the last one on the Drive, and stopped to take the obligatory picture. Rolling off the Drive, I pulled into the Afton Mountain Convenience Store. I went in and purchased a bottle of sports drink, then started browsing the store to decide what food to buy for the next day or two. At first, all I saw was beer, soda, chips, and other junk food. So, I took another tour around the store. Same thing. No. There's got to be something here that constitutes real food. One more try. Well, they did have bread. But that's all I could find. Well, this sure put a kink in my plans. There was no way I could continue onto the Blue Ridge Parkway without food. What to do? I walked over to the Tourist Information office behind the store. "Was there any other store up here in the Gap?" Alas, the answer was no. There was nothing else to do except drop down the mountain into Waynesboro. The very helpful woman behind the counter gave me directions to a couple of the less expensive motels ("We're not supposed to give out prices, but..."), and showed me where I could find a supermarket. I coasted down Route 250 into downtown Waynesboro, then continued a few more miles to arrive at the suggested motel. As I went through town, I noticed the time and temperature sign on a local bank reported it was 98 degrees. After checking into the motel, and taking a nice cool shower, I walked over to the supermarket and bought food for the next couple of days. The roads in Virginia continue to amaze me. The road I was attempting to walk on was lined by a mixture of single family homes, small businesses, and strip shopping centers. Yet the road had four lanes of traffic, with absolutely no shoulders and no sidewalks. What an unfriendly place to live! You couldn't go anywhere without driving. Making it back to my motel room, I cooked dinner in my room and went to bed early. A frustrating and disappointing end to my day.